Welcome to the world of coiled wire jewelry. In the spring of 1996 I saw my first example of beads made with coiled wire. I was shown how to make them by holding an 18 gauge wire in one hand and winding a 20 gauge wire over and over it with the other hand. I tried this method and spent the better part of a day making twelve beads. This was far too much work. I visualized a system using a chuck, a hollow shaft, and a crank. It surprised me when my vision worked so well. In a short time you will be making beads of coiled wire to add to your jewelry creations or sell at bead shows. The Gizmo can also make jump rings or twist strands of wire together. 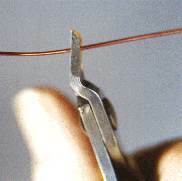 The use of twisted wire is very common in jewelry making and add a pleasing look to designs. 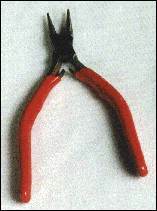 The tools described below seem harmless, however, it is highly recommended that you wear safety glasses when using them. Tools can break and send metal flying. This has happened to me with some pliers as I was squeezing a piece of wire. My glasses stopped the metal from going into my eye. Keep your outrigger clamped to the table at all times. This protects you from running into a rod with your leg when you are walking around the table. Wire and metals that come in sheets are measured with the term "gauge." The higher the number, the thinner the metal. 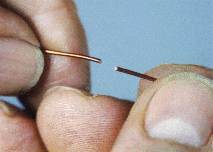 For example, a 6 gauge wire is .162 of an inch thick and a 20 gauge wire is .032 of an inch thick. Take a wire and cut it as shown in Figure G. Now look at Figure H. The wire on the right has a diamond shape. The wire on the left is cut flush. When you cut wire, you want the flush cut side to face the piece you are working with. Begin with copper wire and get a feel for it before moving to precious metals. You can use an assortment of gauges. With sterling, try starting with 20 gauge wrapping wire. You can use the same 20 gauge wire for the core, or do it with 18 or even 16 gauge.